Have you ever wondered how to get a monarch butterfly to rest her weary wings in your yard? This task isn't mission impossible if you've got the right incentives...and once you do, the brilliant beauties will be flapping fiercely at your garden doorstep. Butterflies On Flowers was created to bring you the ultimate monarch experience. We'll offer tips about how to create a butterfly garden that should have your yard swarming with butterflies throughout the summer. 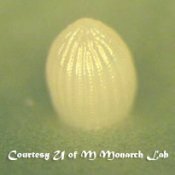 We'll also show you how you can witness the miracle of monarch metamorphosis first hand. Each page will offer interesting monarch facts and beautiful original pictures for your education and enjoyment. What are host plants and should you get some? Which flowers attract monarchs? Other butterflies? Besides plants, what garden accessories should you consider? Also, please take a second to sign up for our latest site updates through the RSS feed in the left column. What's an RSS feed? Alright! It's time to spread your wings and start fluttering around the rest of this site. Enjoy all the visions of butterflies on flowers and learn how to enjoy more in your own back yard. Would you like to share your knowledge about keyphrase? Contribute to www.butterfliesonflowers.com! [?] Subscribe for Free Site Updates! Monarch season is in full sWing and they've been sighted across even the northern most states and up into the land of Celine Dion. A superior way to experience butterflies up close is to raise them yourself. Check out the links below to discover how you can help guide them through a magical month of metamorphosis. ButterfliesonFlowers.com is my personal site. It accepts advertising and other forms of compensation but does not accept compensation to influence reviews of site products or services. The information on this comes from our opinions, research, and experiences. Click here for more about advertising and disclosures. Copyright © 2010 ButterfliesOnFlowers.com. All Rights Reserved.